My recent business travels had me passing through LAX on the way to Palm Desert, so I decided it would be a good opportunity to meet up with some LA friends and check out Ercole’s for burgers, based upon its AHT writeup. Unfortunately, Ercole’s doesn’t serve burgers on Monday nights since they have a MNF special (chili dogs). 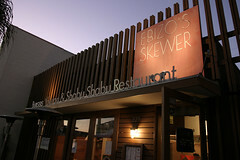 Fortunately, I’ve been around Manhattan Beach several times, so I decided to wander up to Ebizo’s Skewer. I’ve actually been to Ebizo’s before, it’s modest but above-average shabu-shabu joint. However, apparently since my last visit in late 2007, Ebizo’s has decided to get into the burger business as well. That’s right, burgers. There are two things you don’t expect on the menu at a shabu-shabu joint: Belgian Fries and Burgers. But Ebizo’s has both, and does them well. Apparently, the idea was that they already bring in all sorts of good beef, and decided that it would be easy enough to grind some of it fresh to make burgers. So in my case, I ordered the “Kobe” beef burger and a side of Belgian fries. Mind you, I get a little annoyed at abuse of the “Kobe” label. It’s hard to be sure you’re getting real Kobe here, and mostly it’s a nebulous name attached to random well-marbled cuts that, hopefully, at least have some Wagyu lineage. But in any case, if properly prepared, it should make a good burger (it can be a little tough to work with due to the high fat content). But Ebizo’s delivered decently enough. They serve burgers one way (at least without customer intervention), medium rare, which lead to a burger served with a pleasantly crisped exterior and a very moist interior that didn’t completely drain off the fat and texture that make a Kobe burger good (all too often I’ve had Kobe burgers that were a waste of good meat since all the juice drained away). 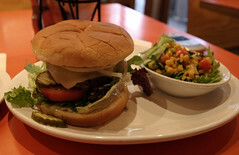 The result was a burger that was quite good, albeit overly juicy. And that’s my only complaint with the burger… if you’re serving a very juicy burger, that’s when mayo becomes more than just a condiment. It becomes a moisture barrier. A thin shmear of mayo goes a long ways towards keeping the bun from getting soggy. I did order a side of garlic mayo, which added a nice savory note to the burger, and helped secure the bun from further sogginess. 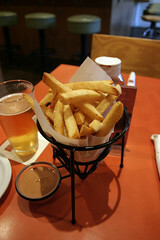 The Belgian fries were also nicely done. A surprisingly large number of places that seem to make a big deal about their fries don’t understand that proper fries really require double-cooking, one to blanch the interior, and one to give the final crisp. It’s not particularly hard, as the streets of large cities in Belgium and the Netherlands are choc-a-bloc with little Frites stands that serve excellent fries. Ebizo’s obviously understands, since my fries were exactly what good fries should be. Tender and fluffy in the inside, and perfectly crisped on the outside without too much browning, these were really good fries. Flaked sea salt finished them off nicely. They did serve them with the infamous “fry sauce” (ketchup and mayo mix) that I don’t really care for, but, luckily, there was plenty of leftover garlic mayo from my burger. Now, if they could only offer some good Satay sauce or curry mayo, they’ve have a perfect hit here. As I’ve often complained here, my little corner of VT and NH suffers from a lack of good ethnic cuisine. One of the more obviously lacking cuisines is Thai. Our area basically doesn’t have many Thai restaurants, and the few we have are generally pretty dismal, so Thai food is one of those things we generally reserve for our trips to other places. But luckily, we don’t have to go all that far (in the grand scale of things) to find some good Thai. Siam Orchid in Concord is pretty decent (sadly, they used to have a location in Manchester as well). But another discovery of ours a few years ago was that a few blocks outside of Montpelier, VT likes another good Thai place, Royal Orchid.